• Boost 60 Hz to reinforce weight of the kick. The area around 40-60 Hz is where the weight of you kick lives. • Don’t be afraid to gently high pass a Rock kick around 20-30 Hz. However some genres like Hip Hop or EDM can go down to 30 Hz and below on Programmed Drums. • Cut Low Mids to remove Mud around 350 Hz. The area around 250-400 Hz on Drums, particular the Kick and Toms can be quite ugly and cutting this area will give more definition to the kick and open your mix up. 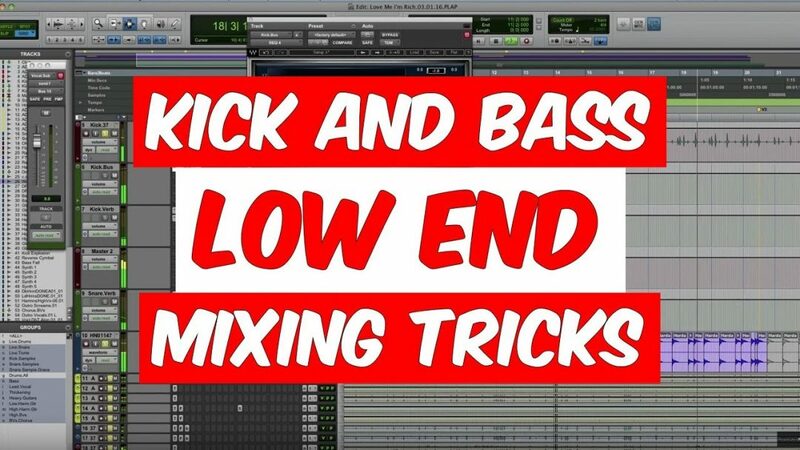 • Cut the lows in the Kick lightly around 80-110 Hz to create room for the Bass Guitar. The area between 80-100 Hz is the sweet spot for Bass guitar to live. I often cut a couple of DB there. Plus multiple Kick mics and samples etc can create a huge build up there. • Boosting 7 K to add click to the kick. 7 k is a very popular area to boost for Rock, however even on other genres it helps. Boosting 2.5 k lightly to add more aggression on the kick. 1 k adds a little ‘toughness’ and is very common practice for mixers to do to in choruses. • You can use a Transient Designer to shape the attack and sustain of your kick. • With only a Bass DI, duplicate the track and add saturation. • Create a Bass Sub/Aux Channel. Sum both elements together. • Gently high pass the combined sound around 60 Hz getting it out of the way of the Kick. • Use a Multiband Compressor and compress 250 Hz and below creating an even low end. • With a Bass Amp as well as a DI use the saturation and High Pass Techniques.